We are currently scheduling rain barrel and green infrastructure workshops for spring and summer. Communities can take action to manage storm water and improve water quality. WMEAC wants to help West Michigan communities take this step by providing low-cost rain barrels and workshops on how to set up those rain barrels. Rain barrels have been proven an effective and easy strategy for managing community storm water issues and improving water quality. Through its rain barrel education programs, WMEAC provides low-cost rain barrels to the West Michigan community as a means of addressing water conservation and pollution issues in West Michigan. All workshops include the necessary components to get your barrel working. You will need to purchase a “base” for your barrel separately (refer to rain barrel instructions). The workshop takes about 45 minutes. To get a rain barrel through our program, you must attend a workshop. We look forward to seeing you out there! 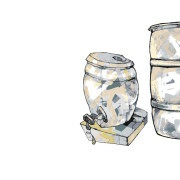 DIY rain barrel instructions are available from WMEAC for download here. We do not sell any of the materials outside of our workshops. Why do I have to attend a workshop? Can I just buy a barrel? WMEAC is not in the industry of selling rain barrels. We offer an educational component on rain barrel usage and stormwater runoff that enables us to provide the barrels at a low cost to the public. In order to receive a rain barrel it is necessary to register and attend a workshop. Do I need gutters to install a rain barrel? Do rain barrels breed mosquitos? Rain barrels could create a mosquito habitat. However, at our workshop we provide mesh screens and assistance to prevent any openings for mosquitoes to get inside. Are rain barrel’s legal in Michigan and Grand Rapids? According to The National Conference of State Legislatures, Michigan does not have laws in regards to rainwater capture and there are no laws against rain barrel usage in this state. The City of Grand Rapids does not prohibit the use of rain barrels, and in fact encourages them as a stormwater capture and reuse method. Grand Rapids is a partner in WMEAC’s Rain Barrel and Stormwater Education programming. There is a significant difference in water laws affecting states east and west of the Mississippi River. East of the Mississippi, landowners have a right to water from a given water body (or its watershed) on a first-come, first-served basis. So, upstream landowners can divert water (install a rain barrel) without legal consequences. West of the Mississippi, there is a historical record of which a landowner has a priority claim to that water, and it is in states such as this where rain barrels are generally restricted. The idea is that if you install a rain barrel upstream of your neighbor who has a priority claim to that water, you are capturing water illegally that belongs to him. How do I prevent algae from growing in my barrel? Algal growth occurs when water is stagnant and/or when sunlight penetrates the barrel. One of the best ways to prevent algal growth is to empty your barrel every 3 – 4 days if water has been left standing. Keeping your barrel out of direct sunlight will also decrease the chances of algal establishment. Another option includes keeping mesh over the water entryway to prevent nutrients, sticks, or moss from your roof from entering your barrel. I have algae in my barrel. Is it harmful and how do I clean it? Algae found in rain barrels are not harmful and can actually be beneficial for your plants, since it adds nutrients to the soil. However it can be viewed negatively for its aesthetic appearance or scent. 2. Add 2 tsp. chlorine or bleach to your rain barrel. This will kill the algae and evaporate in a day or two. 3. Flush the barrel on a regular basis. Stagnant water promotes algal growth. Why is there a 2 barrel limit per household? Due to barrel supply constraints WMEAC has set a 2 barrel limit per household. This is to ensure that those interested in learning about rain barrels and stormwater runoff are able to attend a workshop. Where can I get another barrel? In order to receive another rain barrel from WMEAC it is required that you attend another workshop. WMEAC does not have the capacity to sell individual barrels out of our office location. Rain barrels or rain barrel kits can also be purchased from a local hardware store, such as Rylee’s Ace Hardware. Where can I get additional components for the rain barrel? We purchase our components from Rylee’s Ace Hardware. How can I attach two barrels? The best way to attach barrels is to buy a hose attachment for the overflow valve and connect the rain barrels by elevating one higher than the other. The elevation of one barrel will provide the pressure for the water to flow into the second, lower barrel. Why are rain barrel’s useful in managing stormwater runoff and non-point source pollution? Rain barrels mitigate non-point source pollution by collecting it instead of allowing it to flow from the roof to surfaces that contain pollution and into stormwater drains. Storm drains carry polluted water into nearby streams and waterways and is therefore not able to be filtered through natural process, i.e. soil infiltration. If the water is collected by the rain barrel it can be filtered through the land as you water your garden or yard. Once I’ve removed my downspout, how do I reattach it in the winter once I’ve stored my rain barrel? Crimp the edges of the downspout to fit it back into the attached portion. You can also buy a gutter attachment to make this process easier. What paint is good to use on the barrel? Barrels should be cleaned before priming. Soapy water and a rinse should do the trick! You must apply a plastic primer before applying acrylic paint. Two cans are recommended to coat a 55 gallon drum. After the acrylic is applied, please wait 48 hours of drying time before applying a top coat to seal the acrylic. Why do I need to place my rain barrel on a sturdy base 12 to 24 inches above ground? Rain barrels can weigh up to 500 pounds when full. Dirt can move and settle differently under that kind of weight, sinking the barrel into the ground. The base support is also necessary for proper usage in order to have access to the spout which is located near the bottom of the barrel. Also, because gravity is the driving force that will remove the water from your barrel a higher height will allow for more water pressure. Why is rainwater better for my plants? Rainwater contains the nitrogen that plants seek as a necessary nutrient for growth. This nitrogen isn’t contained in tap water. Tap water does contain chlorine and fluoride which is not always beneficial to plant growth. Is rainwater safe to use to water my vegetables? Many people are concerned that using water from a rain barrel for produce is unsafe due to chemicals or animal droppings that may reside on the roof. However, studies indicate that the water is safe to use in the garden. As with any fruit or veggie, wash before consuming. Also apply water directly near the roots (using a soaker hose) so as not to apply the water directly to the produce. What is the cost benefit of using a rain barrel? How many gallons of water can I save? You can save up to 1800 gallons of water per summer season in Grand Rapids. This can equate to a monetary savings on water usage by $23 – $32 per summer season with one rain barrel installation.